1965, a time of change and revolution, Surf Music treaded water, barely hanging ten at the top of radio charts on the crest of a thin wave. 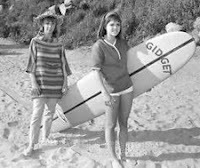 C'mon Gidget, let's go surfin'! The British Invasion continued to slam water over Surf Music in 1965. 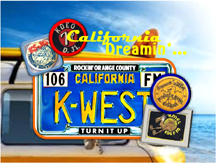 With “Help Me Rhonda” at KRLA/Los Angeles, The Beach Boys clung tightly to the #6 spot in June. But Rhonda was traveling east, as the song listed downward on Houston’s KNUZ at #13. A nearly decade-long tidal wave between Westinghouse Broadcasting and NBC, with accusations of extortion, finally petered out in a courtroom decision on June 19. In the ensuing switcheroo, Westinghouse wrested away their original Philly stations, while the court ordered bully NBC to reclaim their former Cleveland stations, voiding the original 1956 trade. So … Cleveland’s KYW call letters which NBC had hijacked from Philly in 1956, floated back to Westinghouse, nine years later … really guys?! Apparently the wheels of justice were rusted from the salty surf … speaking of surf … it’s time to grab your goofy foot grommet and bouncy beach bunny to hang ten with Gidg! Featured Radio Survey(s): The BFYP Collection does not (yet) include a June 1965 radio survey, so I’ve posted a fun KGB/San Diego survey from September that judiciously celebrated both sides of the pond with the KGBeachboys ‘Boss 30’ DJs and The Beatles’ “Yesterday” at #1. Enjoy the moment … again!